Cargill announced a voluntary recall of 185,000 pounds of ground turkey produced at its facility in Springdale, Arkansas. 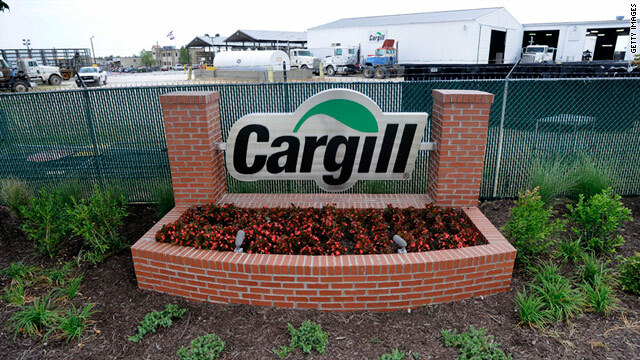 Editor's note: Go to the Cargill website for a full list of products being recalled. (CNN) -- Cargill Meat Solutions Corp. has announced for the second time in less than six weeks a voluntary recall of ground turkey products after tests found they were contaminated with a strain of salmonella bacteria that can prove fatal. "That's one of the challenges and frustrations about trying to get one's arms around a naturally and randomly occurring bacterium that exists throughout the environment," said Mike Martin, director of communications for the company in Wichita, Kansas. "It is frustrating but it strengthens our resolve to also do more to find additional methods and measures that are going to further reduce the potential for pathogens that can cause food-borne illnesses." The latest recall, of 185,000 pounds of ground turkey meat, was announced Sunday for products produced August 23 and 24, and 30 and 31 from the company's establishment in Springdale, Arkansas. No illnesses have been linked to the current recall. The previous recall was one of the largest in history, affecting 36 million pounds of ground turkey meat produced at the plant between February 20 and August 2. In all, 2 million pounds of the tainted meat were recovered and buried in a landfill. Federal health authorities said the August recall was associated with an outbreak of multi-drug-resistant Salmonella Heidelberg, which killed one person and sickened 111 others in 31 states. After the outbreak was discovered, the company suspended production of ground turkey products at the processing facility for eight days and instituted stricter production processes, Martin said. In the wake of the August recall, antibacterial washes were added and "the most aggressive sampling and monitoring program in the industry" was put into place, Martin said. But federal health officials took a sample on August 24 and found the same Heidelberg variant of the bacteria, one that is resistant to a number of antibiotics. A second sample taken on August 30 came back with a presumptive match, he said. "We know it came in with the birds," he said. "We're looking at the entire supply chain back to, obviously, bird farms." He added, "We understand that people expect their food to be safe when they purchase it, and we are going to do everything we can to ensure that's the case." But the ubiquity of the bacteria means there could be similar recalls in the future, he said. The U.S. Department of Agriculture's Food Safety and Inspection Service recommends meat be cooked to an inner temperature of 165 degrees Fahrenheit (74 Celsius), a temperature that kills bacteria. The sickness usually lasts four to seven days, and most people recover without treatment. But, in some cases, it can cause severe diarrhea and require hospitalization. If the infection spreads from the intestines to the bloodstream and then elsewhere in the body, the bacteria can prove fatal, according to public health experts.